Stress B is formulated to provide the combination of B Vitamins and nutrients that are most important for adrenal function and stimulate natural cortisol production. It provides activated B vitamins, vitamin C, and L-carnitine, as well as BioPerine® to support nutrient absorption. Our adrenals are vital glands found in our abdomen. They produce the hormone cortisol that helps regulate your metabolism and your response to stress as well as aldosterone which helps you control blood pressure. Adrenal stress or adrenal fatigue is a condition in which chronic stress over time leads to an overstimulation of your adrenal glands. Consistent stress overtime can lead to inconsistent levels of cortisol(the stress hormone) in your bloodstream, either too high or too low. Individuals who have underactive adrenal function as a result often times have low levels of DHEA which acts as a master hormone for many other bodily functions. Adrenal fatigue can snowball into other areas causing poor health and well-being. Stress B features Pantothenic acid, in a special bioactive form, and is a precursor to coenzyme A which is an essential cofactor in the production of glucocorticoids in the adrenal cortex tissue. Adrenal tissue has very high concentrations of coenzyme A. B6 is another b vitamin found in sufficient quantities in our formula and is critical to the maintenance of healthy adrenal function. it plays a role in affecting adrenal hormone receptors and is critical for healthy adrenal function. Our formulas features folic acid as 5-MTHF, a patented form called Quatrafolic®. This methylated folic acid is a highly bioavailable form of folic acid and exhibits superior absorption over non-methylated forms. Folic acid is important for building and repairing protein that may be broken down by stress hormones. It is also key to the synthesis of serotonin, a neurotransmitter that affects mood, appetite, and sleep, all of which are often negatively affected by stress. Our diets, environmental toxins, stress from work and home, major life events, etc. all add continued stress on our adrenal glands. Nutrient support for your adrenals is an important part of any healthy lifestyle. Getting the nutrients we need from diet alone often times leaves us falling short. Stress B is designed to provide specialized nutrition support to optimize adrenal function and promote overall well being. Folate / 5-MTHF / 5-Methyltetrahydrofolate is present in the form of Quatrefolic which is a metabolically active form of folate and helps to support methylation, increase cellular energy and support both phase I and phase II of detoxification especally environmental toxins. 5-MTHF supports DNA synthesis and repair and also supports the production of neurotransmitters such as dopamine, epinephrine, norepinephrine, histamine, L-DOPA, serotonin and estrogen metabolism. Acetyl-L-Carnitine / ALCAR is a form of L-carnitine the amino acid and is vital for neuroprotection. ALCAR is able to pass the blood-brain barrier where it stabilizes cell membranes, acts as an effective antioxidant, and protects brain cells from toxic chemicals and stress-induced damage. ALCAR enhances energy production in the brain and supports the production of acetylcholine which is a neurotransmitter essential for learning and concentration. Black Pepper Extract / BioPerine is important to pair with turmeric due to its ability to enhance absorption. BioPerine is a patented extract of piperine from black pepper fruit. The body’s thermogenic activity is activated and this provides a more efficient mode of transportation for the nutrients to enter the bloodstream. BioPerine also provides a patented, controlled-release delivery of nutrients that prolongs the time to flow through the intestinal system. The result of this pairing of ingredients is a significant increase of utilization of the powerful effects of turmeric in small quantities and gaining optimal outcomes. Stress B is a nutritional supplement intended to provide nutritional support for adrenal functions. 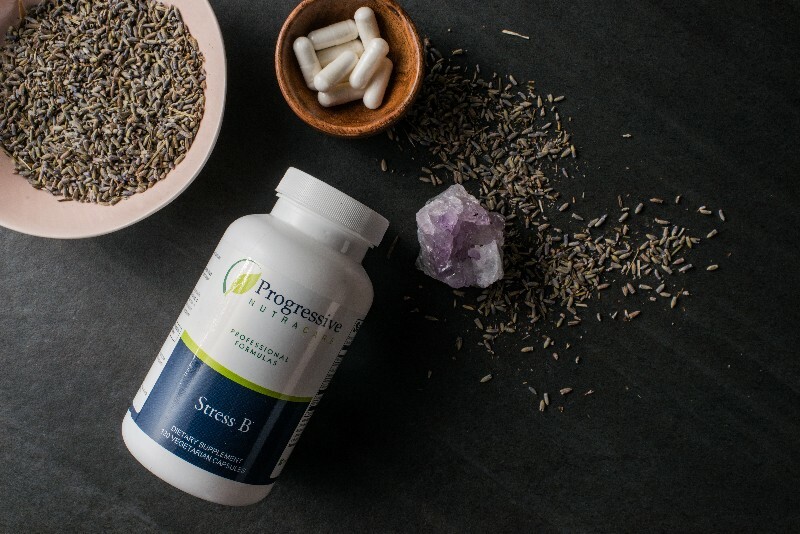 Stress B is for individuals who may be low in cortisol production, are looking to increase energy levels, assists with mental clarity and sharpness, as well as individuals looking to improve their immune system and stress response. Stress B is intended to take 1 capsule twice daily or as directed by your healthcare practitioners.